We promise this is not a joke! Today, we have released MANY changes for Fundly CRM v2. These changes impact a large number of areas of the system. We know there's a lot to take in as this release has some of our biggest behind-the-scenes logic changes ever. We'll be holding a "New Release Overview" webinar on Tuesday, April 2nd at 11:30 AM PT and again on Wednesday, April 3rd at 11:00 AM PT to go over the changes (register at fundlyevent.com). We'll be offering several "deep dive" webinars on the changes to contact records later this month. Look for a New Release Newsletter later this week with details. Introducing... drum roll, please.... Work/Home addresses for individual contacts! Ta da! 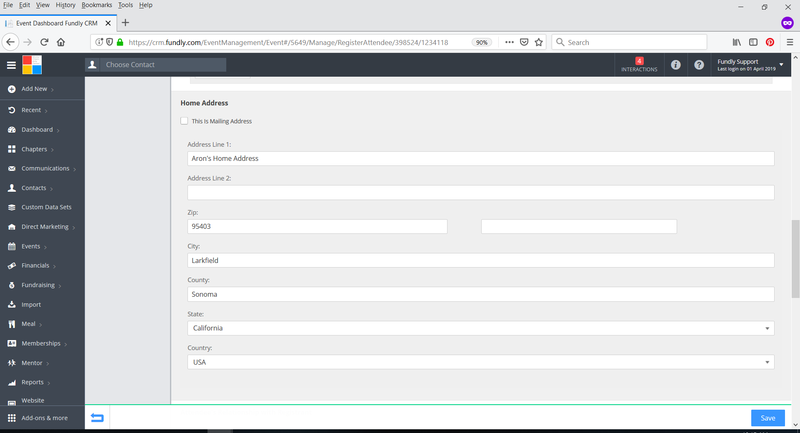 Now when adding an address to the Mailing Address or Other Address block on an individual contact record, you will be able to categorize that address as a home or work address. We've also added a "swap" button that allows you to swap an address that is in the Other Address block for an address in the Mailing Address block, making it simpler for you to generate communications to either address (the address you want to include in a communication must be in the mailing address block BEFORE generating the communication. But you can use the swap button to move the correct address to the mailing block prior to generating your communication). More dramatic, but less apparent, there is a complicated set of logic behind-the-scenes tied to the Work/Home Address changes. For instance, now only an address categorized as "home" can (and will) be shared among household members (before, the mailing address was shared. Now, the home address is shared, regardless of whether it is in the Mailing Address block or the Other Address block). Additionally, when adding a new mailing address via online sync/transaction, manually updating the address, creating a new household, merging duplicates, and the import utility, there is a set of logic dictating when the address currently in the Mailing Address field gets updated/overwritten and when it gets saved and moved to the Other Address field. These changes impact many areas of the system. The Mailing Address field on event registration and membership forms (for both direct entry and online transactions) and in the online Public Profile area has been relabeled Home Address and a check box for "Use as Mailing Address" has been added. Depending on whether or not this box gets checked, the Home Address will be saved to either the Mailing Address or Other Address field. See the last article in this newsletter for more information about the form changes. This logic change has also necessitated changes to the Import Utility for the import of Individual Contacts and Organizational Contacts. Before importing contacts, be sure to read the new step-by-step tutorial and download our newest template. For any contacts in a household who are sharing a Mailing Address, we have set that address to a "Home" address. All other Mailing Addresses are left as uncategorized. It's critically important that you understand how uncategorized addresses are treated when householding contacts or when importing data for existing contacts. Please review the information in the Individual Contacts: Add/Edit/Share/Delete Address(es) tutorial linked below. There is no way to update the "home/work" address drop down in bulk on records. You will have to edit records individually to categorize them as home or work. There is no drawback to leaving records uncategorized except in the case where you are householding contacts. Address must be set to Home to be shared with household members. A static work address (an existing address set as uncategorized) CANNOT be converted to a work address. Selecting "work" from the home/work address will bring up the "Add Work Info" pop up window. Review the Individual Contacts: Add/Edit/Share/Delete Address(es) tutorial linked below for more details. We STRONGLY encourage you to spend some time reading the tutorials to familiarize yourself with the new logic. The logic regarding updating addresses is fairly complex; we've created a table within the Add/Edit/Share/Delete Address(es) tutorial to try and simplify the explanation. Contact us at support@fundly.com if you have any questions. But wait, there's more! 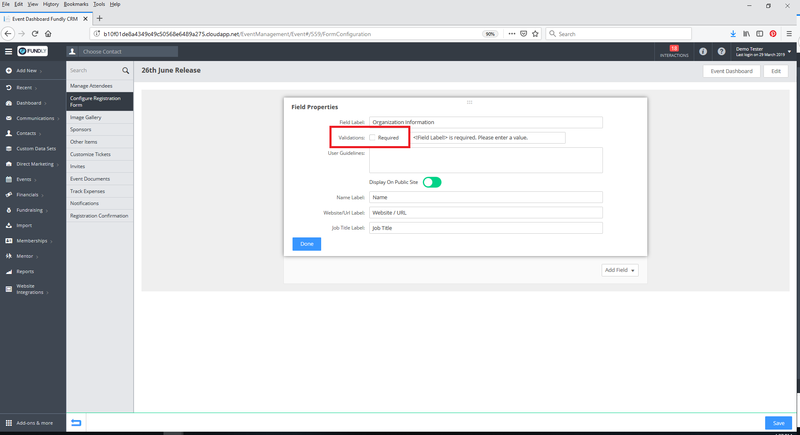 The work address category is tied to the Work Info (employment) tab, so you can select the address of the company the individual is associated with as an employee as their work address. 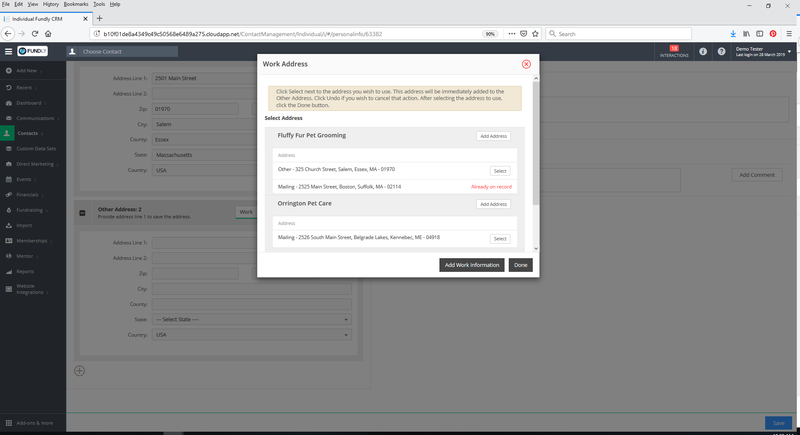 When you select "Work" from the Work/Home drop down, a pop up window will open allowing you to select an existing address from the contact's employer, add an address to an employer, and/or associate a new employer to the contact. This also makes it possible to now add Work Info to an individual's record via adding a Work Address on the Personal Info tab. This makes it faster and easier to associate individuals and organizations together as employer and employee. It also makes it easier to keep your data tidy - update the work address on the employee's record and it updates on the organization record and vice versa. Nifty! In addition, by adding a work address, you can add work information and by adding working information you can add a work address - data entry is simplified and streamlined and you won't have to visit multiple tabs to enter all the various pieces of information. 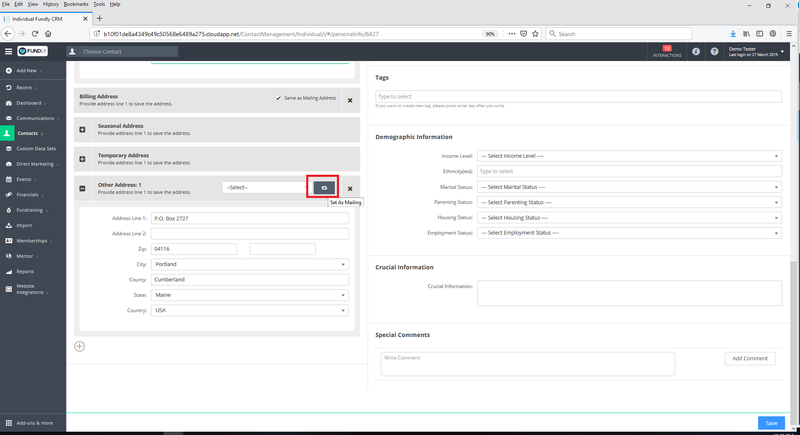 And when you add or edit Work Information on Individual Contact records and Employee Information on Organizational Contact records, you will have the option to share any Mailing or Other Addresses associated with the employer / organization to the employee's/individual's record. 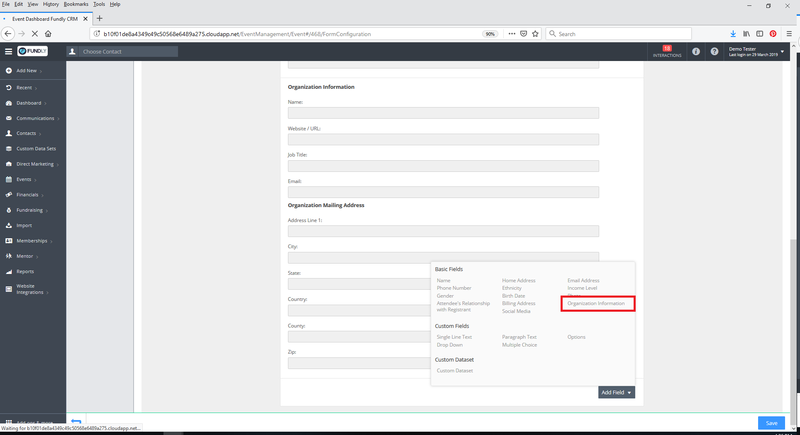 If the organization has a Mailing Address or Other Address on file, the address(es) will appear in the lower half of the Add/Edit Work Information screen, and you can use the Share button to add that address to the individual contact's Mailing Address or Other Address field. We've made a minor tweak to default salutations. Previously, if any part of the default salutation placeholder was missing, the system just populated the parts that it had. 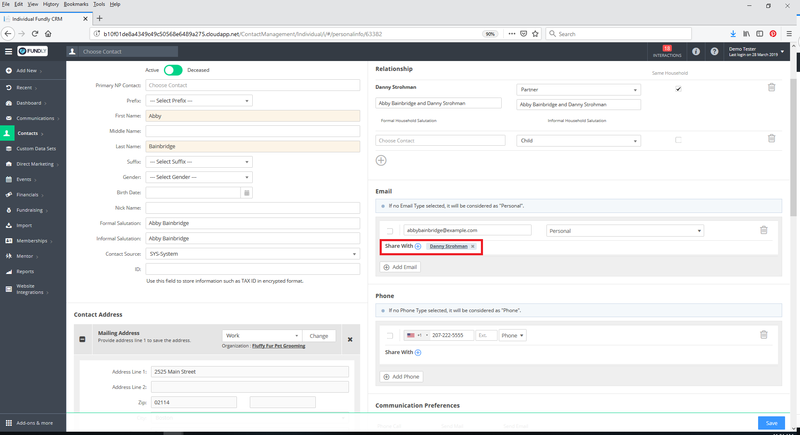 For example, if the default formal salutation was set to populate Prefix and Last Name and the contact didn't have a prefix, then the default formal salutation field would just show the Last Name. For Household Formal Salutation and Household Informal Salutation, the salutation field would populate only if ALL of the placeholders were in place. If, for instance, one of the household members was missing a prefix, then that salutation field would be blank/wouldn't populate at all. Now, we've changed it so that all six salutation fields (Individual Formal, Individual Informal, Household Formal, Household Informal, Organization Formal, Organization Informal) populate using the same logic and will populate using a "fall back" or alternate style if any part of the placeholders are missing. 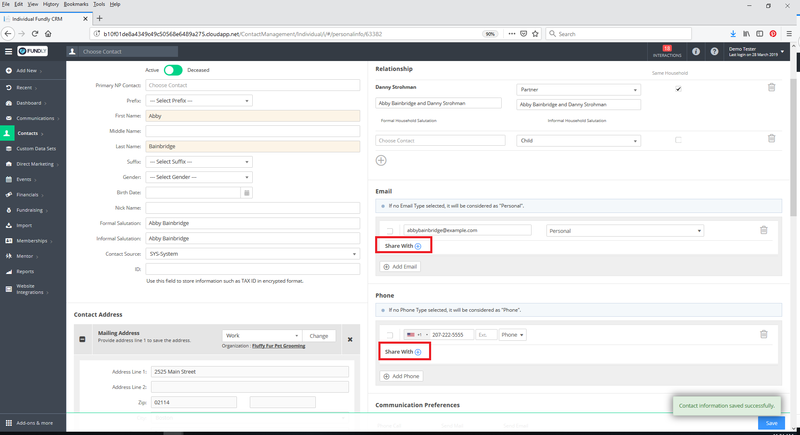 For example, with the new change, a contact's salutation field that populates based on Prefix and Last Name and which has the Prefix missing, would populate using First Name and Last Name instead. This new logic will auto-populate a salutation that is more useful (and will require less manual fixing when trying to generate communications) when there are gaps in the data in a record. As before, you can always over-write a default salutation with a custom salutation. We've made some changes to the screens/steps for the process of householding two or more contacts together. Previously, when indicating two contacts were in the same household, users would select which contact was the "primary" member of the household and their mailing address was shared to the secondary members' records. Now, when householding contacts, there is no "primary" household member, per se. Now, it's more of a "co-householding" situation. The yellow banner at the top of the screen indicating who is the primary contact in the household has gone away. Instead of mailing address being shared, the address categorized as "home" will be shared (regardless whether or not that is in the Mailing Address or Other Address block). If only one person in the pairing has a home address, that is the one that gets shared to both contacts. 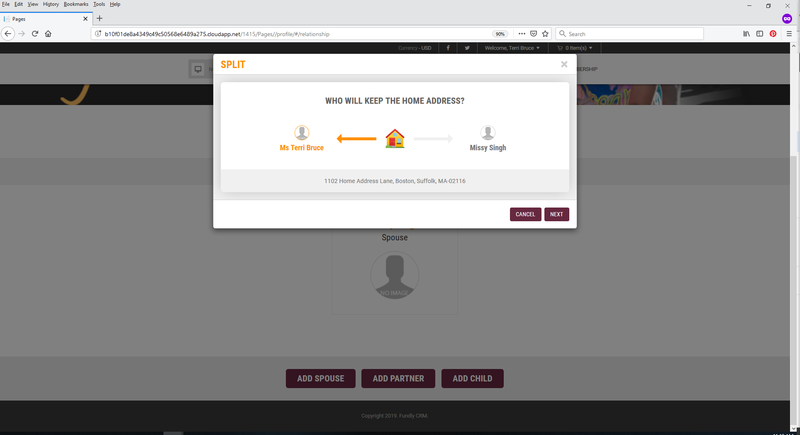 If both of them have a home address at the time you set up the household, then you will get to pick which address is used as the home address. Most of the changes here are behind the scenes related to the new Home Address changes and to the way householding works. For the most part, you won't see a lot of impact to the user interface. 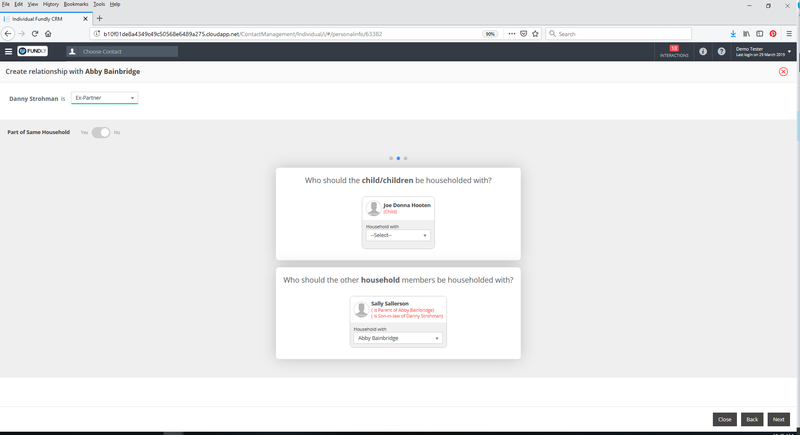 Familiarizing yourself with the way shared addresses work when initially householding contacts is the most important thing to understand (the non-selected home address gets erased/overwritten). You'll also see changes related to sharing phone numbers and email addresses (detailed in the next section) among household members. These changes impact a large number of areas of the system. 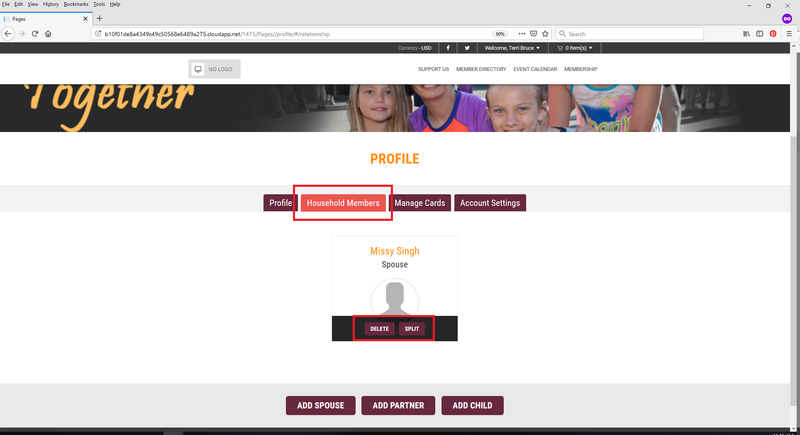 On the public profile/website integration side, there have been several changes to the user interface to accommodate these changes. 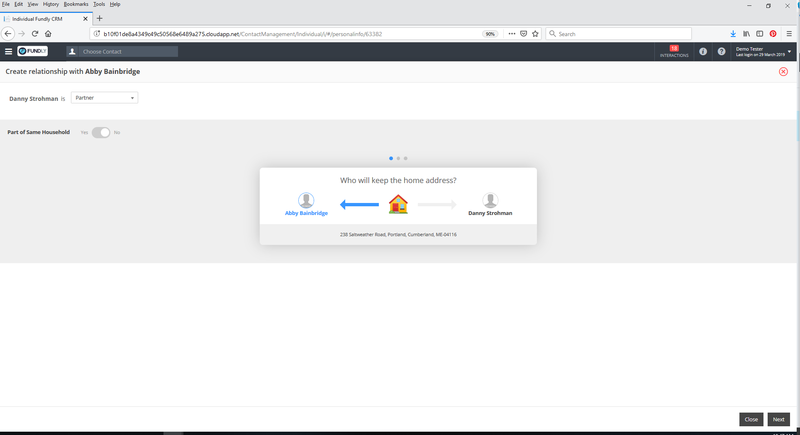 Users will now only be able to create relationships for household members and specifically only for spouse/partner and/or child (previously users could create all relationship types online). The relationship tab in the public profile has been relabled Household (for both Pages and Plug-Ins). We think you'll agree this change is very exiting! Previously phone numbers and email addresses could be marked as "household," which meant they were shared to the record of ALL household members. Now, we've added some control to whose records shared phone and email addresses get shared to. Under the phone number and email address fields, you'll see a new "Share With" button. Click that and you'll be presented with a list of household members. Select which ones you want to share the email address or phone number in question with. So now, for example, Mom and Dad can both share their cell phone numbers to their daughter's record, but not to each other. Sweet! We've made some changes to the screens/steps for the process of removing a person from a household/splitting a household. Previously, when splitting a household, you would simply deselect the "same household" box/toggle. However, this process was creating snarls on the back end (who should keep the home address in this case? Who do other household members stay householded with (such as minor children)? Etc. And then have an opportunity to confirm your choices. 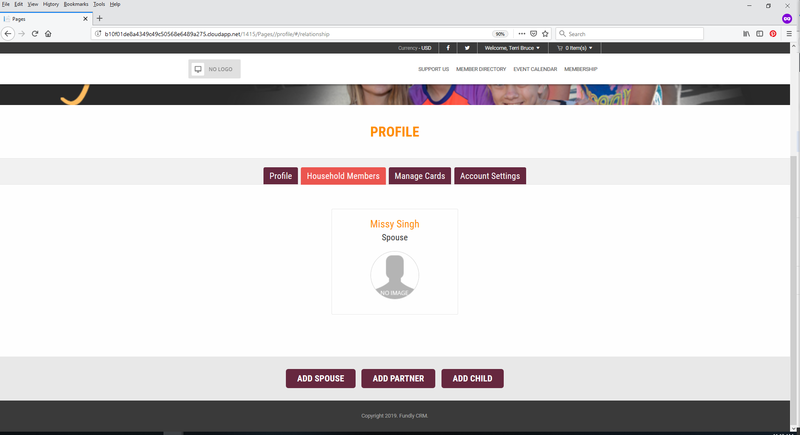 Contacts can also remove household members (children and spouse/partner) from their online public profile, and we've made a few changes to the user interface (for both Pages and WP Plug-Ins) there as well. As noted in the Add Household section above, the Relationships tab has been related online to Household and the creation of relationships online is now limited to spouse/partner and child. With the update, now when the user hovers over the relationship, the options presented will be Delete (delete the contact) or Split. If the user clicks split, they will enter the split household flow outlined above. You're really going to like this one! Now, duplicate prevention will check ALL email addresses (not just the email marked as primary) and Other Addresses (in addition to Mailing Address) when those things are used in duplicate prevention. 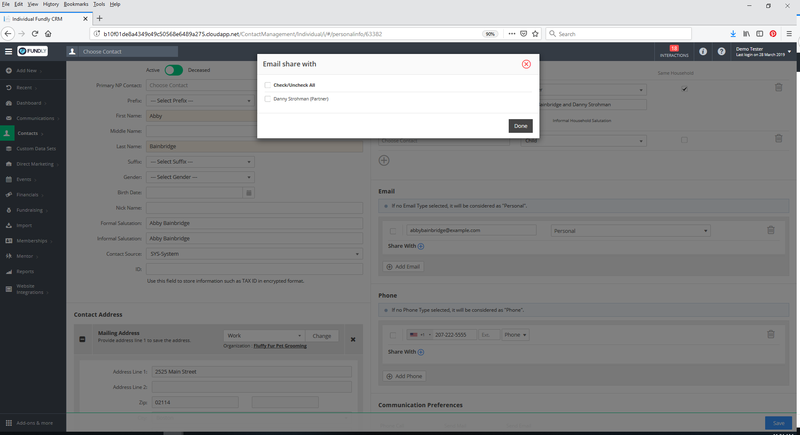 This change applies to direct entry inside CRM, records that come in online through your website integration or through Fundly Connect sync or Fundly Pro sync, and records entered via the Import Utility. You don't need to do anything differently; if you are currently using email address or any part of the address in duplicate prevention, the system will now include all emails and Other Addresses automatically. If you haven't been using either of those in duplicate prevention due to the limitation of the system only checking the primary email/mailing address, now might be a good time to add those to your duplicate prevention configuration (and if you haven't checked your duplicate prevention settings recently, now is a good time to do so and see if they need any tweaks). Based on support tickets/questions, we've also realized there was some confusion about how duplicate prevention works. There are TWO layers of duplicate prevention in your system - real time protection, in which the system updates the existing record when it finds a match between incoming data and an existing record, and an offline, once per week or month quality assurance check using "fuzzy logic" to look for potential duplicates which are flagged and queued in the Review tab of Manage Duplicates. These are two separate processes. We've updated our tutorials to make this clearer and added a new tutorial on the quality assurance/fuzzy logic search. We've made working with Auction Purchases easier than ever! Previously, auction purchases could only be imported. In addition, they were recorded as a straight purchase. Any amount paid over the Fair Market Value was recorded as a separate donation transaction (the two transactions were tied together via the Invoice Number). This made is difficult to produce a thank you letter to your purchasers/supporters, since a donation acknowledgement letter would only be generated when the purchaser paid over the Fair Market Value (and only the portion over the Fair Market Value showed as the amount paid in the letter). Now, auction purchases will be recorded as a single transaction, and that transaction will be a donation. If the amount paid for the item is less than the Fair Market Value, the tax deductible amount will be $0. If more than the Fair Market Value is paid, then the amount over the FMV will be recorded as tax deductible. In addition you will be able to write an acknowledgement letter on the total amount paid/total transaction (while specifying the amount, if any, that is tax deductible). But wait, there's more! 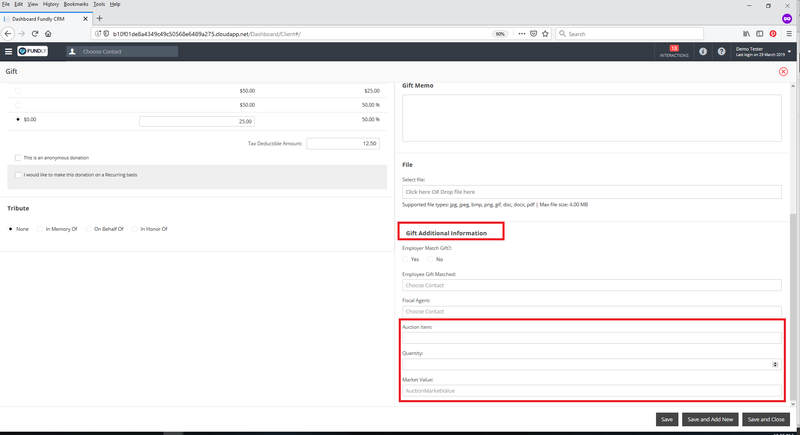 Not only can Auction Purchases be added via the Import Utility, they can now be added directly into the system (the same as any other donation) and Auction Purchases, whether manually inputted or imported, can be edited. We've had to make a few changes to the Add Gift screen to accommodate these changes. The first is that we've added a new field for "Tax Deductible Amount" under the Ask Array/Gift Amount area. This field autopopulates based on your Ask Array settings. However, you can manually type over/edit the field. 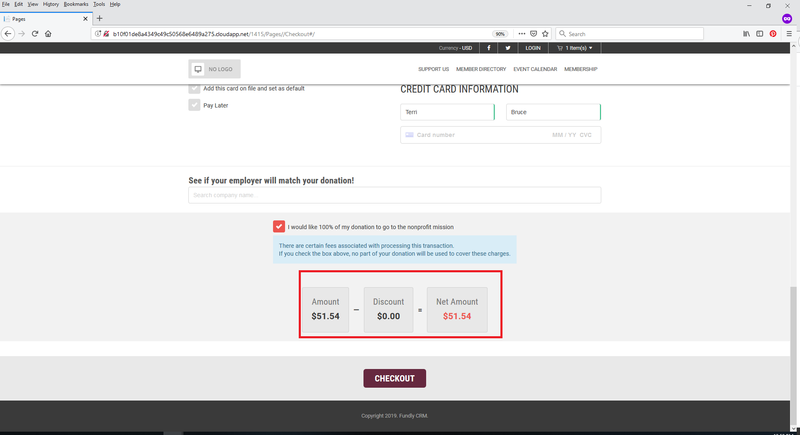 Please Note: if you are EDITING a donation, the tax deductible field will not automatically update if you change the gift amount. You will need to manually update the Tax Deductible Amount as well. 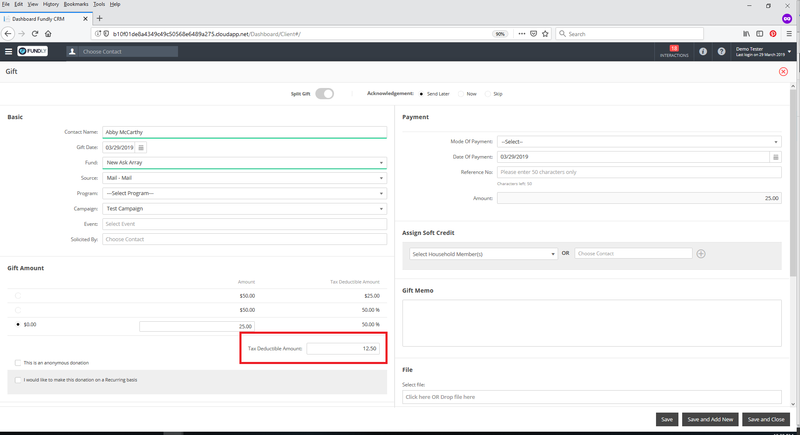 In addition, you will notice some new out-of-the-box fields in the Gifts Additional Information custom data set for Auction Item (description/name), Quantity, and Fair Market Value. These fields will auto populate from your data file when importing and will allow manual entry when you are entering data by hand. Please do not make any changes to these fields (the field names or format) as they are tied to behind-the-scenes logic for calculating the tax deductible amount for Auction Purchases. These changes are covered in the Auction Purchases Changes section above, but we wanted to make sure you didn't skip reading about these changes if Auction Purchases don't apply to you. We've had to make a few changes to the Add Gift screen to accommodate the Auction Purchase changes, but these changes apply to ALL DONATIONS. 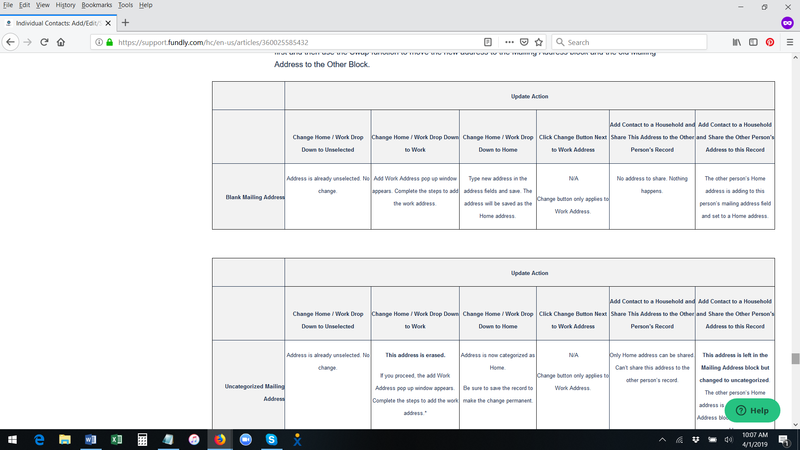 Please review the changes detailed in the Changes to Auction Purchases section above to familiarize yourself with the changes to the Add Gift screen. (apologies for repeating information! 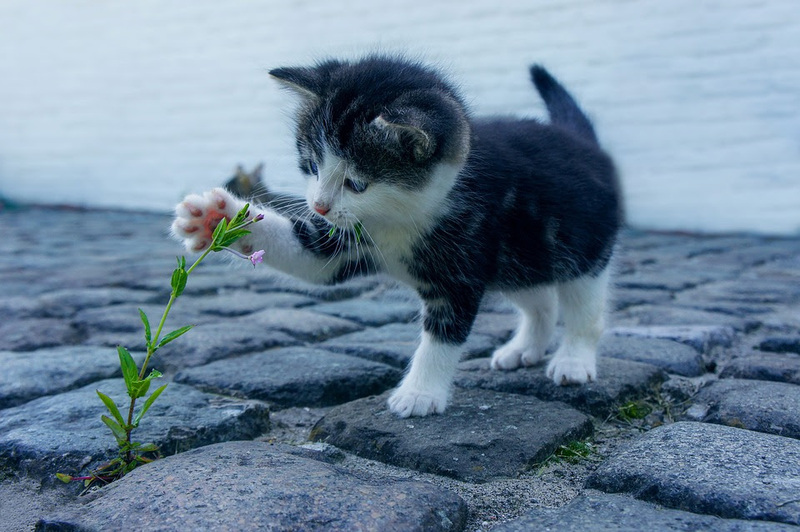 Here's a picture of a cute cat to make it up to you!). You know how you can pass on credit card processing fees for Events (you do know about that, right???). And you know how you've been asking if it was possible to pass on credit card processing fees for donations? Guess what???? There is no configurations or settings for this one. 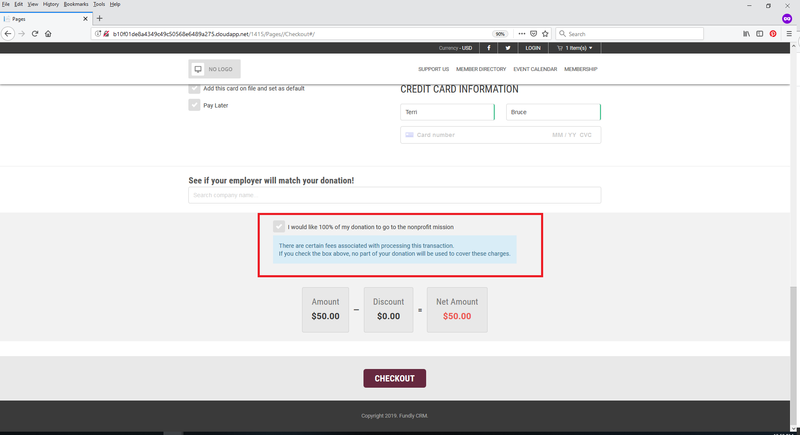 Now, when your donors check out online (via Pages or WP Plug-In), they will see a new checkbox that will allow them to add a few dollars on top of their donation to cover the Stripe credit card processing fees/fees charged by Stripe (Fundly doesn't charge you any fees for donations). The new check box is at the bottom of the check out page (last step/page of the online check out process). 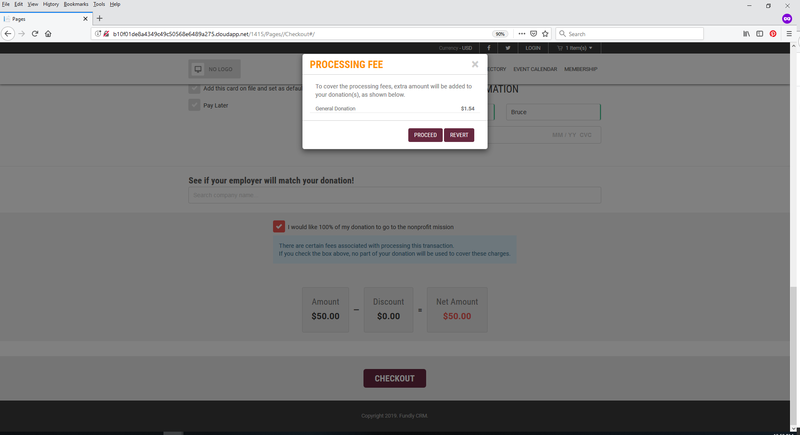 If the user checks the box, a pop up window will alert the user that the fees will be added on to their donation. If they choose to accept/proceed, their donation total will be adjusted to cover the fees. This change is ONLY for donations processed online. Direct entry donations will still have the fees charged as usual (the reason for this is there no mechanism for the donor to give their permission to cover those fees when your staff are entering the data into the system). The "Amount" field has been relabeled "Total Amount"
"Time Frame" has been relabeled "# of Installments"
The second/unlabeled field under Time Frame has been relabeled "Frequency"
As part of the changes to Work/Home Address and Create Household we've made a few changes to Event Registration and Membership forms. Those changes are covered in the other relevant sections of this newsletter. We just wanted to point them out and make sure you didn't miss them. 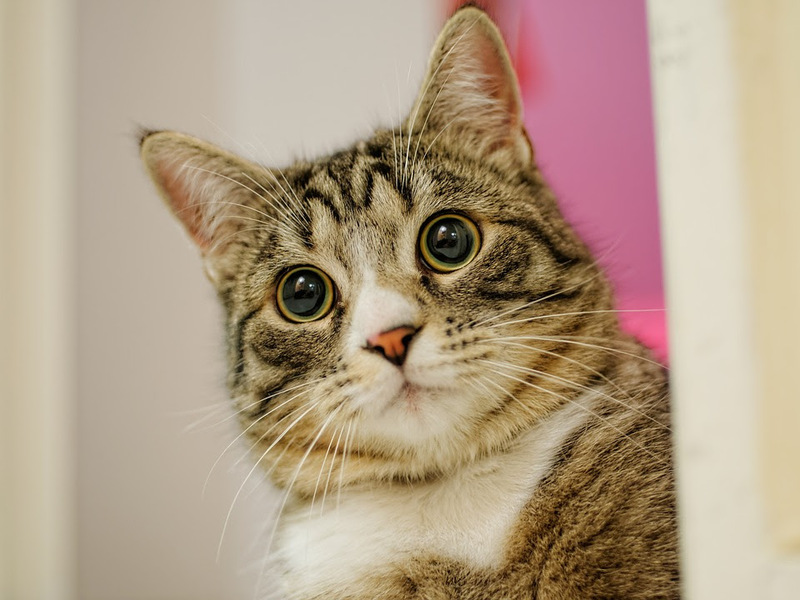 Oh, who are we kidding... we just wanted an excuse to give you another cute cat picture. The Organization field/widget has been removed/is not longer available. The Organization Information widget IS still available and should be used for collecting organizational information. If you were using the Organization widget on an active registration or membership form, we have updated your form(s) for you and replaced it with the Organization Information widget over the weekend. The Organization Information widget now has a setting for whether or not it is required to be filled out. 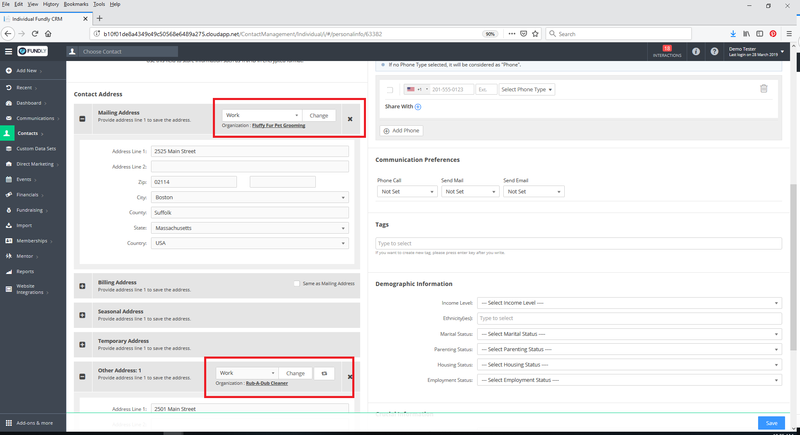 However, even if the required field is not checked, any fields used in your duplicate prevention settings will be required if the user fills out any part of the field. 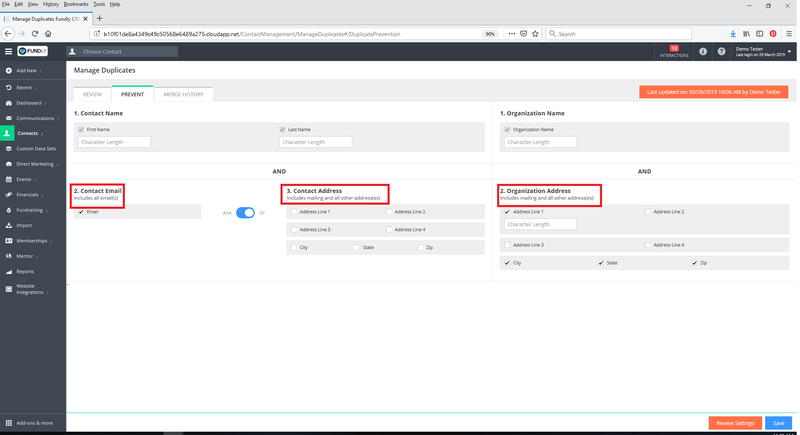 That is, if you use Organization Name and City in duplicate prevention and the user enters an Organization Name, Organization City will become required as well. The Mailing Address field has been renamed to Home Address. A checkbox for Mailing Address has been added. 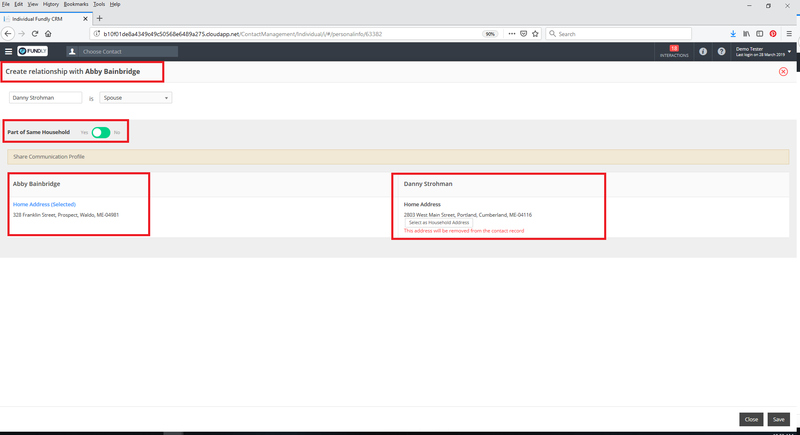 User can still indicate if their Billing Address is the same as their Mailing Address, but the "same as mailing address" checkbox will not be checked when the billing address is added to their CRM record. See the Individual Contacts: Add/Edit/Share/Delete Address(es) tutorial for more details. 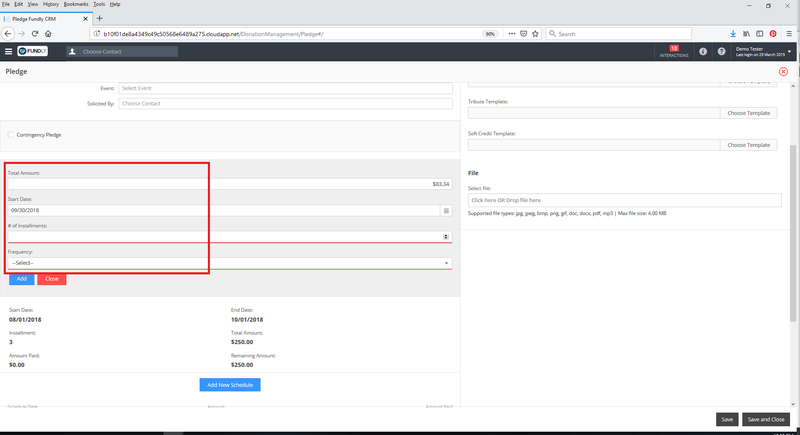 And, last but least, we've said it elsewhere but just to make sure it doesn't get overlooked: we've made several significant changes to the Import Utility for Individual Contacts, Organizational Contacts, and Auction Purchases. 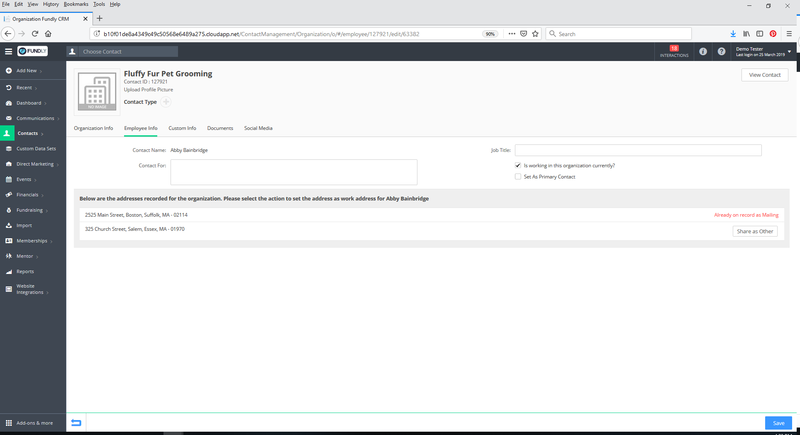 Before importing anything, be sure to grab our updated template and review our new 8-part, step-by-step guide for importing individuals (in the Import Utility section of the support library). We'll be adding step-by-step guides for the other kinds of imports over the next few weeks as well. Hopefully, the new step-by-step guides, including an extensive down of all the things to pay attention to when formatting your data file (and some handy tips for ways to speed up the QA check on your data file before uploading it) will help cut down on confusion and frustration. As we said before, we know it's a lot of changes to take in. We'll be holding a "New Release Overview" webinar on Tuesday, April 2nd at 11:30 AM PT and again on Wednesday, April 3rd at 11:00 AM PT to go over the changes (register at fundlyevent.com) (you only need to attend one session, though you're welcome to attend both). We'll be offering several "deep dive" webinars on the changes to contact records later this month. Look for a New Release Newsletter later this week with details. If you have staff that should be signed up for our newsletters, they can do that at fundlyevent.com (newsletter sign up at the bottom of the page).